First Siouxsie, then The Cure, then even the Sisters… now Bauhaus feel the bite! The contribution to goth from Bauhaus, both as a collective and from the later careers of its assorted members can not in any way be overstated. They didn’t invent goth, but they perfected it. Bauhaus defined a certain time of darkness, and it’s easy to forget that they were in reality only together as long as your average local garage act. A quarter of a century — that’s how long it had been since the quartet had released Burning From the Inside. You can’t possibly know what to expect from such a happening. All we knew was that the band had decided to get back into a studio after a reunion concert at Coachella just to see what would happen. What happened was an amazing record. I’m sorry if you don’t agree, but not only is Go Away White exactly what we should have seen coming in retrospect from the last several albums by Peter Murphy and Daniel Ash, but it was accomplished with style and an easy grace. Why then is it such a disappointment? Well, it certainly is to Bauhaus, I can tell you. Maybe not in terms of quality, but at least in terms of sales. When I interviewed Ash several years back, he mentioned that the record had sold only around 5,000 copies and that piracy downloads made turning a profit even more of a joke. More to the point, though, Go Away White never had a single chance of pleasing anyone. It lacks pretty much anything that first drew people to Bauhaus in the first place save the members themselves. It has none of that droning, meandering poetry. In its place is a collection of dark pop that sounds more like a late-stage Iggy Pop release, or even the weirder moments of Jack White. You simply cannot compare something like “Who Killed Mr. Moonlight” to a song like “International Bulletproof Talent.” They don’t exist in the same universe, and they cannot in any way call to the bat-infested souls. There’s no room for the grand baroque emptiness that made Bauhaus the band it was in the modern world. In short, it wasn’t anything that was going to reawaken the forgotten youth of the Oldgoths, anymore than it was going to regrow Peter Murphy’s hairline. READ THE REST HERE >>> The Five Most Disappointing Goth Albums: Bauhaus, Go Away White – Houston – Music – Rocks Off. I pretty much agree – there are very few decent tracks on it, and the filler makes it less of a studio LP and more of a curios compilation… and it adds nothing to the Bauhaus legacy… this was a real missed opportunity, and I don’t think we’ll see a third Bauhaus re-union tour (although I did see Peter Murphy on the Mr Moonlight tour recently and, as a show, it was 95% as good as seeing Bauhaus – although I did miss seeing Danny Ash throwing shapes). And thanks for the support – please come back – and tell your friends! 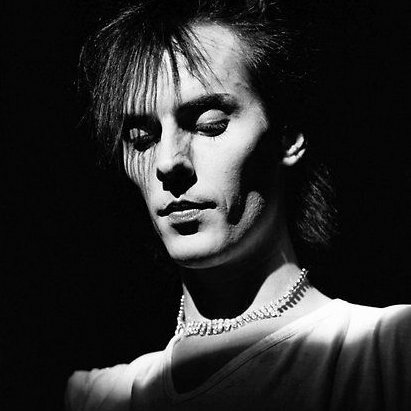 Yeah, I saw that London gig as well, pretty good and I do not believe we will ever see Bauhaus together again, going by all the band history, and disagreements, I think, it’s probably a good thing it never happens again. I’ve shared your FB page to my friends as I think you’ve got an awesome blog. That’s very kind – thanks. I was at the Bristol show, and I am currently half way through a review… If you fancy having a go at writing a review we are always looking for guest writers, why not giove it a go? (I hadn’t written anything like this until I started G&A 18 months ago – it’s easier than it looks!) Simon wrote a guest review for the Cure session bootleg LP, read it here. We should start up some sort of network of blogs named after Bauhaus tracks… I bet there’s more. Excellent review (& blog) – I will post some of it here if you don’t mind. No, don’t mind at all. Good idea, one of my fave Bauhaus tracks, and thought it perfectly titled for the blog.